"Which is the lesser evil - to be born having suffered damage, or not to be born at all?" THE MINISTER for Health has conceded that the Government’s proposed abortion laws will probably result in more babies being delivered having ‘suffered damage’ because of their premature delivery. 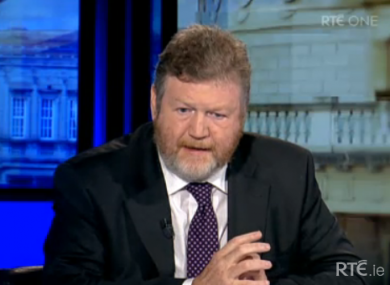 James Reilly said it was inescapable that laws allowing pregnancy to be terminated would result in more children being delivered in a premature state – a condition which would ultimately mean health difficulties for the baby. “I accept that,” Reilly told RTÉ’s The Week in Politics, after being asked about the potential impact on juvenile health – though insisting that the only alternative was to force the pregnancy to continue, which could risk both the lives of the mother and child. He then added: “Which is the lesser evil – to be born having suffered damage, or not to be born at all? The minister insisted that the constitutional right to life of the unborn would still take precedence over the legislation, and that a clinician’s duty was to offer the best possible treatment to both a pregnant woman and the unborn child. Reilly also criticise those who claimed that the legislation would result in viable foetuses, who may be only weeks away from full term, being killed. “People have been misled here [...] that somehow a child’s life would be terminated as a consequence of terminating the pregnancy,” the minister said. It’s very clear in the law – a woman in this law has a right to have a termination where her life, as opposed to her health, is at risk. That does not confer any right on her, or anybody else, to end the life of the baby. Reilly said that in all cases, “the baby will be supported – and if it’s a viable baby, that baby will be born”. “To suggest that babies would be, as some have, aborted with a view of terminating their lives right up to the point of birth, is utterly misleading and very disingenuous. Separately, Reilly said he was confident that a motion tabled by FG backbencher Peter Mathews, where he will ask the Fine Gael parliamentary party to vote on whether the party whip should be lifted for votes on the legislation, would be defeated. Mathews has proposed that members have a ‘free vote’ on the Protection of Life During Pregnancy Bill – a measure which Enda Kenny has repeatedly ruled out. Email “Reilly concedes that abortion laws will mean more babies 'suffering damage'”. Feedback on “Reilly concedes that abortion laws will mean more babies 'suffering damage'”.